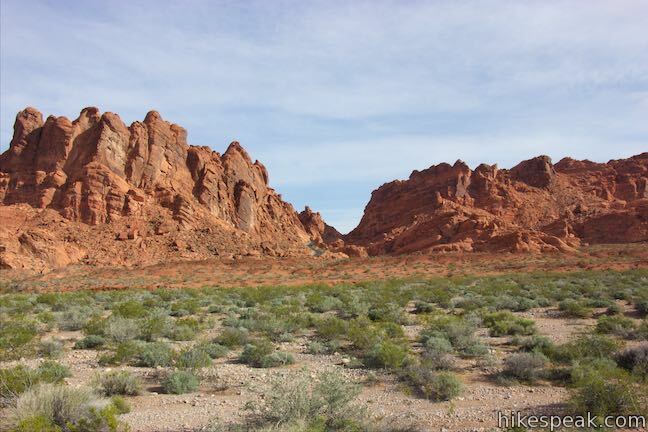 Every road through Valley of Fire State Park is scenic. The biggest wows come on White Domes Road, an official state and national scenic byway. 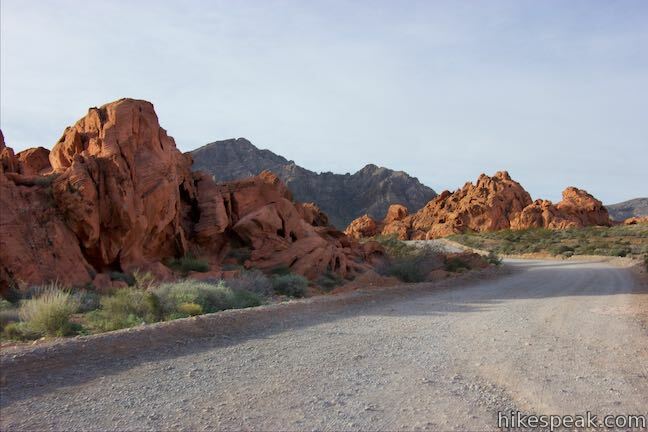 The main road through the park, Valley of Fire Highway, is honored for its surrounding beauty as well. 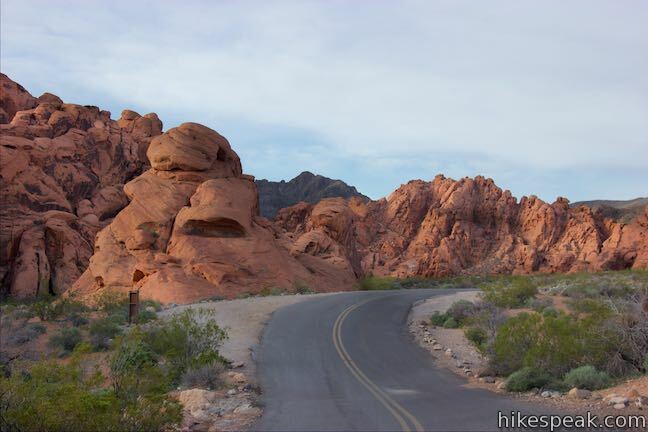 Scenic Loop Road branches off Valley of Fire Highway and can be used to bike or drive a 3-mile circuit past numerous natural attractions. 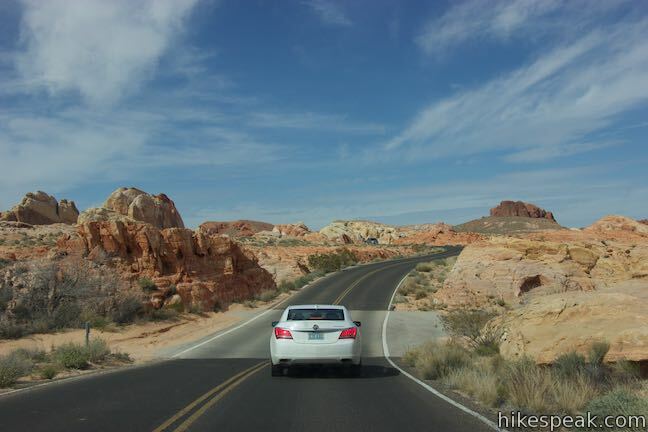 White Domes Road is 5.7 miles that should be driven or biked by all visitors. 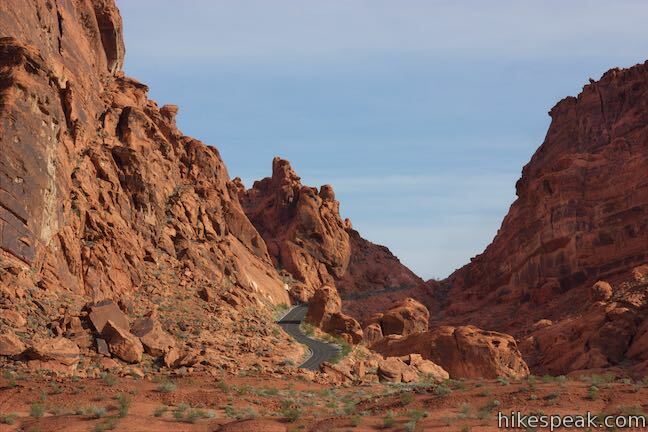 The road (also know as Mouse’s Tank Road) leaves Valley of Fire Highway near the park visitor center and starts with an audacious ascent between tall ridges of red sandstone. 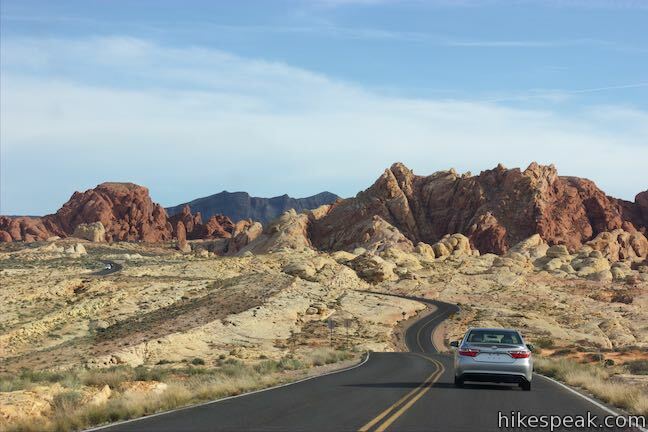 The road’s surroundings somehow get more picturesque from there, passing numerous postcard-worthy vistas surrounded by vibrant rock formations. 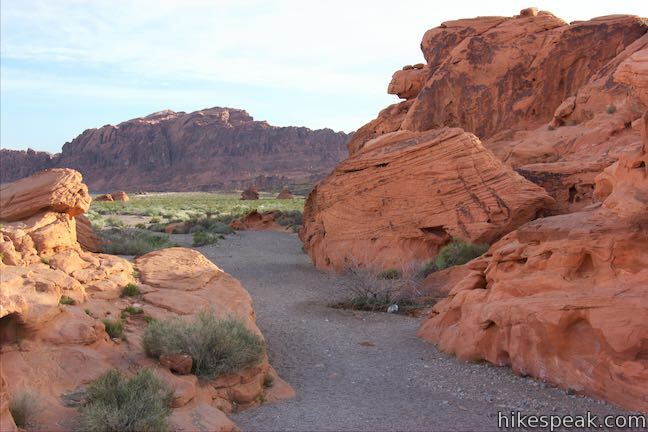 Hikers can explore beyond the road where it passes Petroglyph Canyon Trail to Mouse’s Tank, Rainbow Vista Trail, and Fire Wave Trail before ending at day use area bordering White Domes Trail. 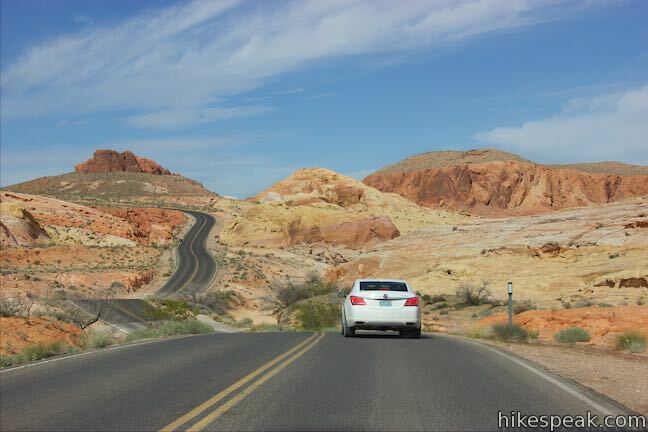 Scenic Loop Road should also be explored. 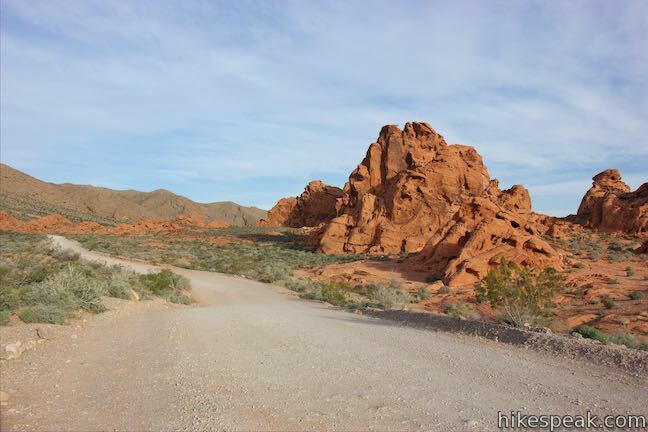 Located on the southwest side of the park, this road is only two miles long (one mile of which is unpaved) and connects to Valley of Fire Highway at both ends. The intersections are one mile a part, creating a 3-mile loop that is action-packed and enjoyable by car or bike. 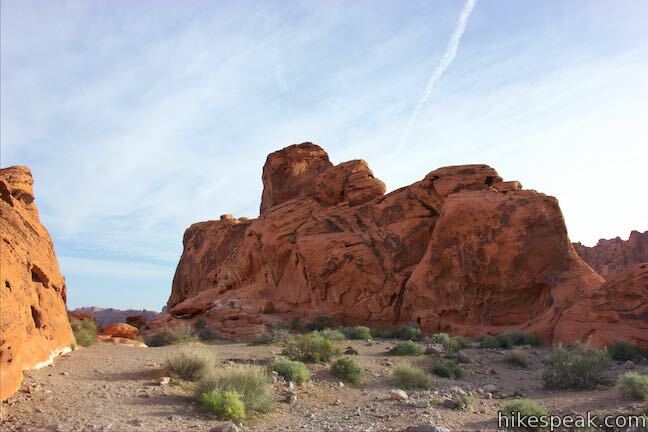 Scenic Loop Road passes the park’s two campgrounds, Atlatl Rock Campground and Arch Rock Campground, as well as the attractions they are named after, Atlatl Rock and Arch Rock. 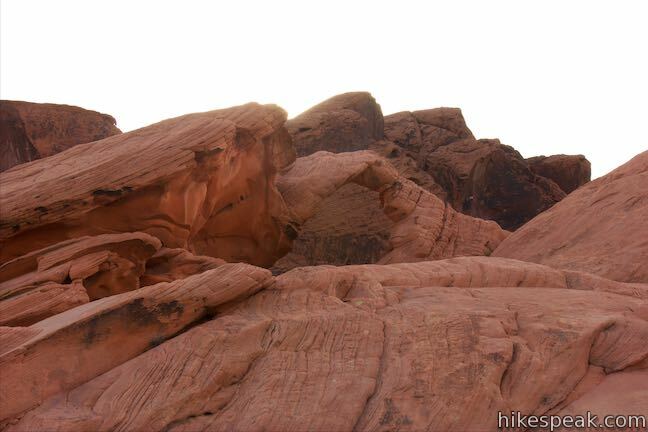 Atlatl Rock offers a great display of petroglyphs, visible at the top of a metal staircase, and Arch Rock has a natural arch just above the road. 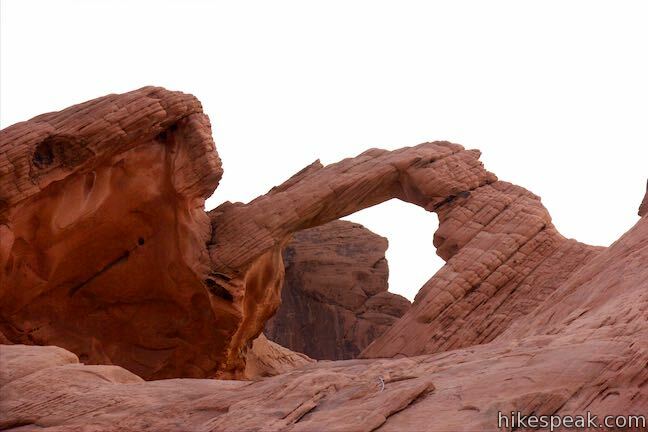 Unable to withstand the blasting of strong winds and the slow dissolving away by rains of the cementing materials holding its sand grains together, the rock weakened, allowing an arch to form. 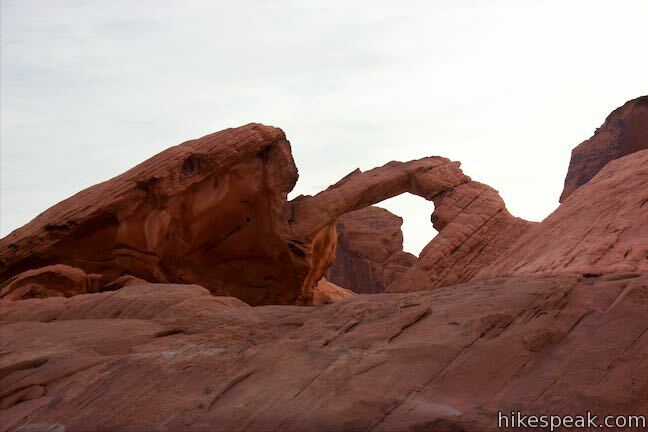 Eventually, the arch will grow too large for its support, and nature’s forces will complete their work of destruction. 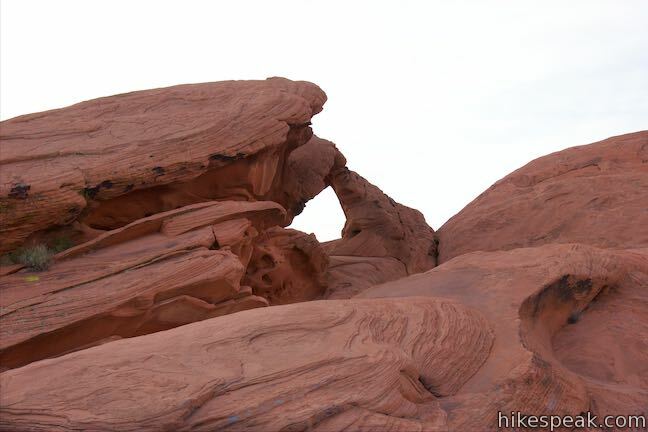 Obviously this natural arch is fragile, and the sign asks visitors not to climb on the rock. 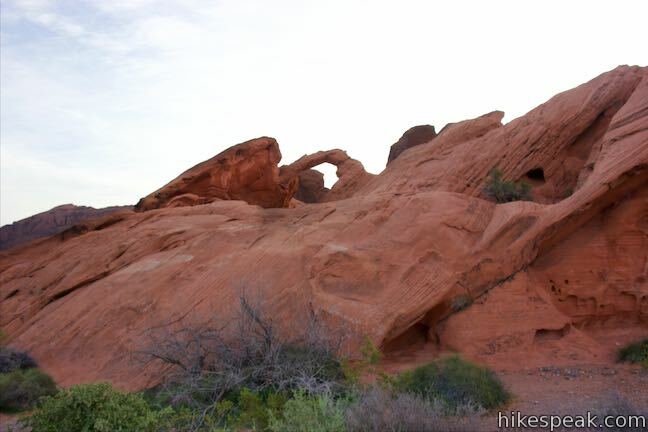 Arch Rock will be back lit at sunrise, but should be painted a vivid orange at sunset. 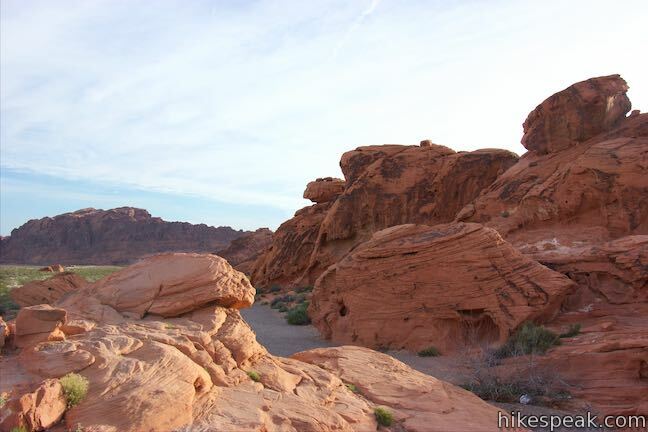 No hiking is required to check out Arch Rock. 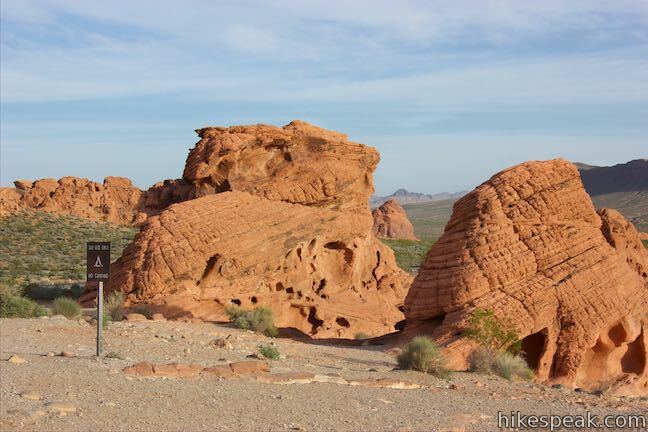 Past Arch Rock, Scenic Loop Road turns to gravel and takes a rolling route around misshapen formations of red sandstone full of smaller arches and alcoves. 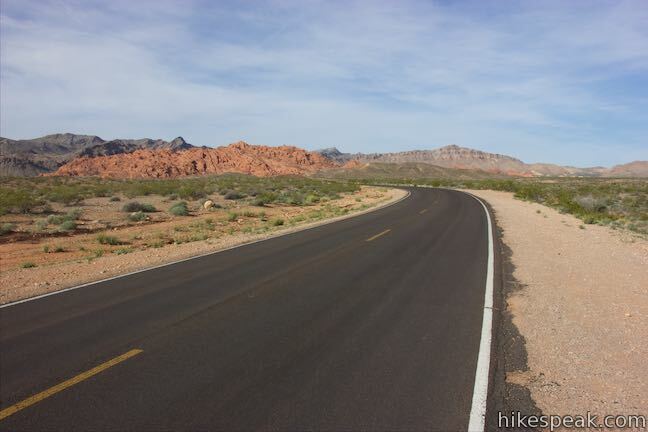 At the west end of Scenic Loop Road, return to pavement, and turn left on Valley of Fire Highway. Shortly after making the turn, you will spot a gravel turnout on the right for the Beehives. 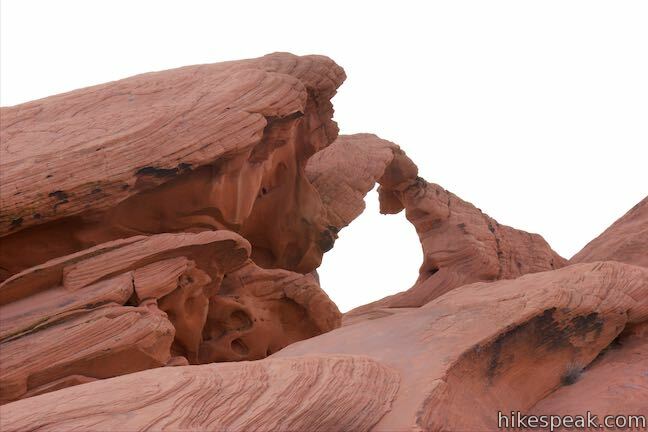 The Beehives are a unique formation that can be seen without any hiking. 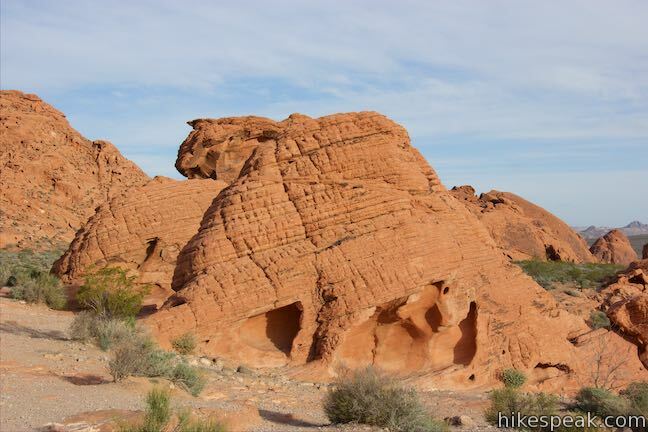 The turnout on Valley of Fire Highway has an information kiosk, describing the Beehives’ geology. 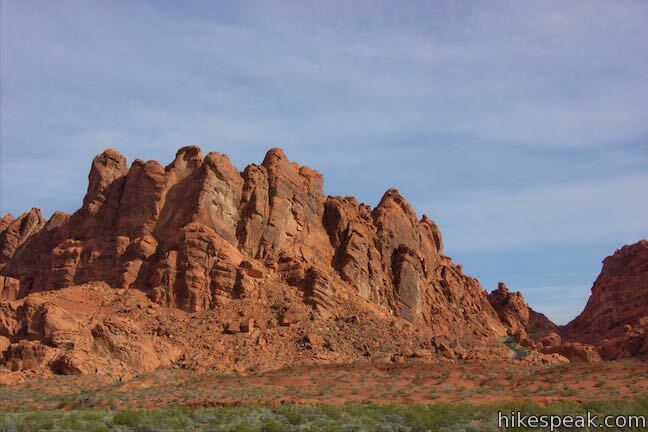 Look to the left to see mounds of sandstone that easily resemble beehives. 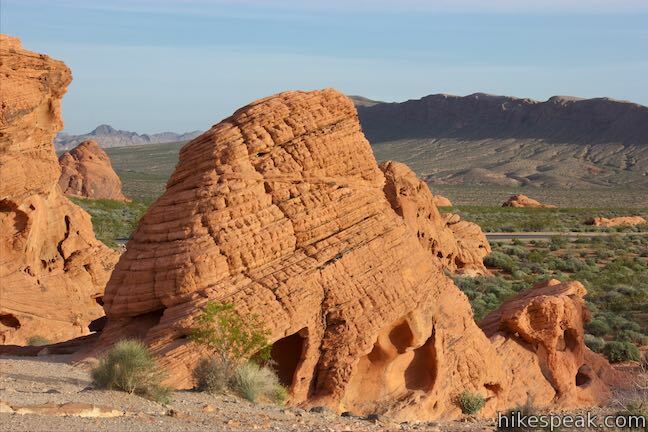 The Beehives are an example of geologic cross bedding with grooved lines going in different directions. 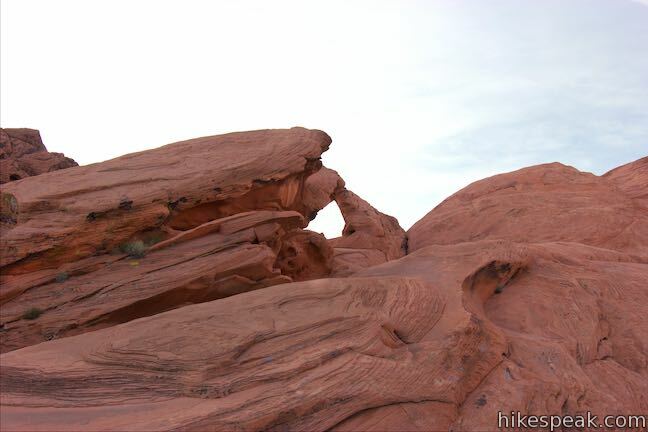 Geologists can look at rocks like the Beehives and learn how the sandstone was formed. 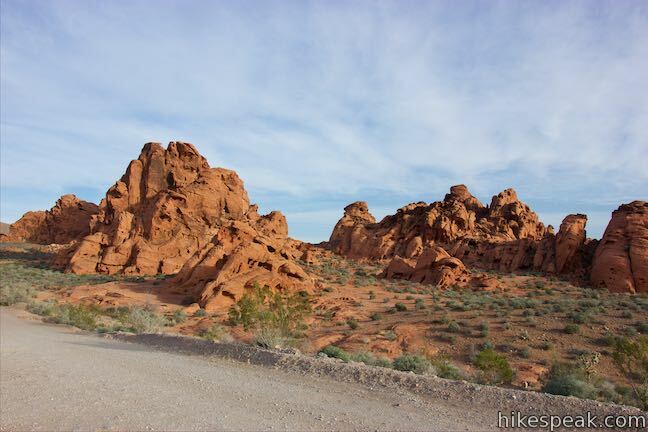 Leave the Beehives and go another 2/3 of a mile up to an intersection with the northeast end of Scenic Loop Road, leading back to Atlatl Rock, Arch Rock, and their adjacent campgrounds. 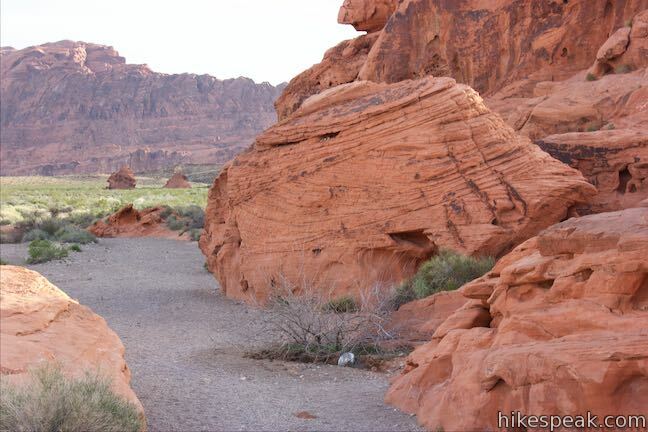 Across from this end of Scenic Loop Road, a short gravel road leads to Petrified Logs Loop, a 0.3-mile long trail to a small petrified forest. 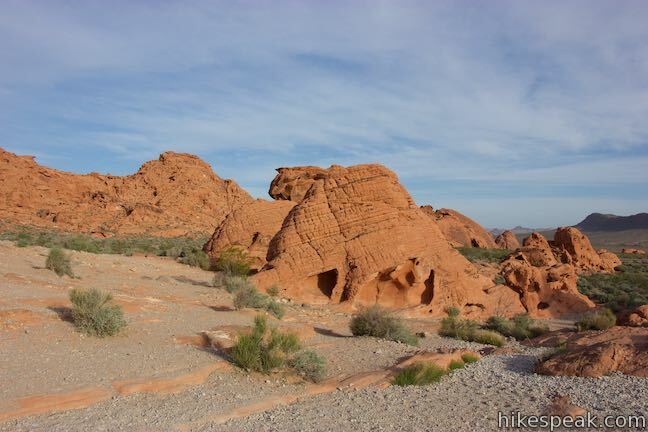 To get to Scenic Loop Road: From Las Vegas, take Interstate 15 north for about 35 miles to exit 75 (signs for Valley of Fire State Park and Lake Mead National Recreation Area). 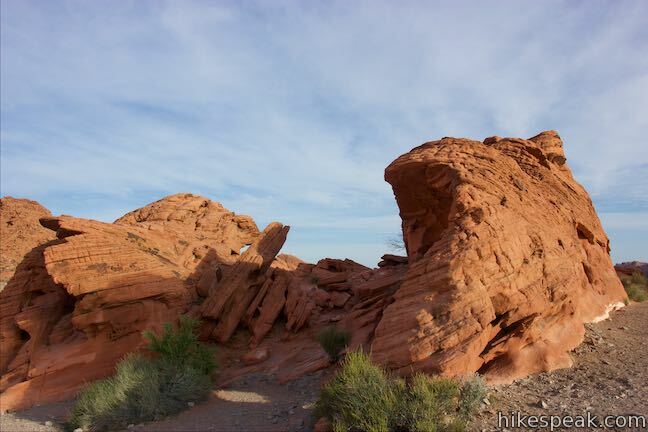 At the end of the offramp, proceed southeast on Valley of Fire Highway. Reach the park’s west entrance after 14.5 miles. 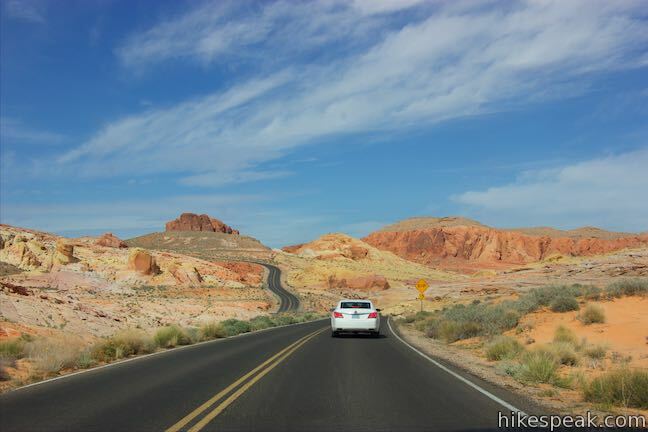 Drive another 1.8 miles to the left turn for Scenic Loop Road (Campground Road). 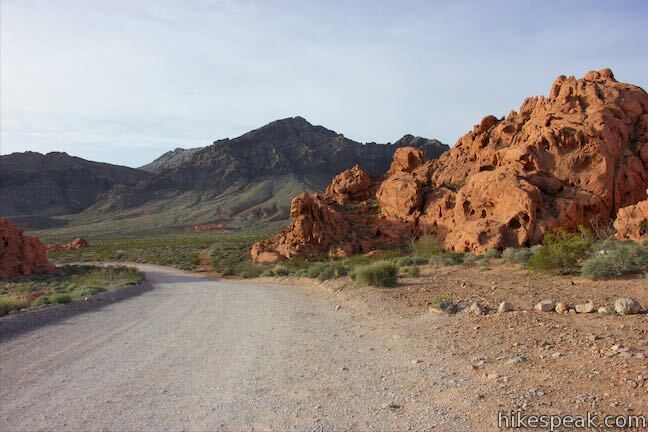 Drive another 1.7 miles east on Valley of Fire Highway to the intersection with White Domes Road, also on the left. 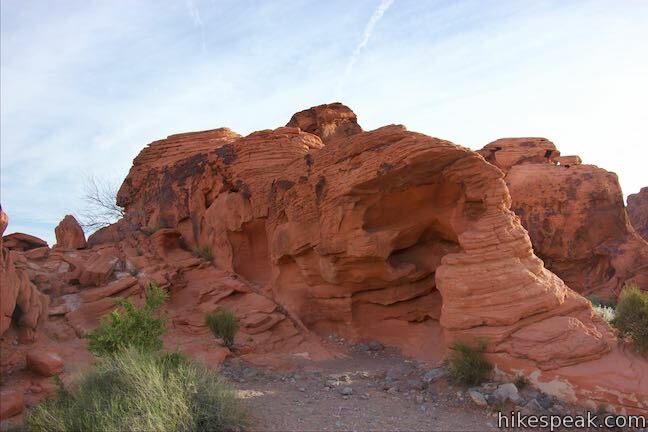 This hike of up to 1.5 miles goes up a sandstone mini-summit with tremendous 360-degree views over multi-colored landscapes and then continues on to Fire Canyon Overlook.